Paytm FLYHIGH Offer|| Paytm is here with a great offer in which it is offering flat 15% cashback on Booking Flight Ticket . Maximum cashback of Rs 1000 . Grab this offer Now..!! 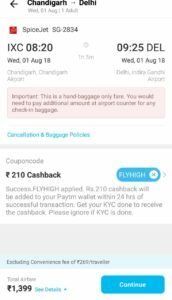 How to Avail Get Rs 1000 Cashback via Paytm FLYHIGH Coupon ? 7. Apply coupon code – FLYHIGH and make the payment ! Your ticket will be booked and you will soon receive cashback in your PayTM wallet.